Two weeks ago I had a national appliance company come out and look at it. It wouldn't make the noise, so the repairman wanted to wait and come back when it would. Now he was a very competent man, but his company is super busy. So the inevitable happened probably a few days ago it died. I called this national company two days ago and tomorrow was the quickest they could be here. Not quick enough for all my expensive organic meat! Daniel urged me to call around this morning and I called all the companies in our area in the yellow pages. And I prayed a lot. We are going out of town next week and what would I do with my food? I guess to some people this wouldn't be a big deal. But part of my "job" as a housewife is finding food to store away, putting up strawberries, finding great deal on meats, cooking big meals and freezing some for later. Losing all my food was losing all my hard work. So one of the companies called back, JW with Appliance Specialist. Look him up in the yellow pages. He came out, took the freezer apart immediately. He had to go get a part from the appliance repair store, but he still did this within hours of my call. I love small business owners, they care about their business so they care about pleasing the customer. Now hopefully my freezer is going to cool off quickly and I can put my meat back in there. 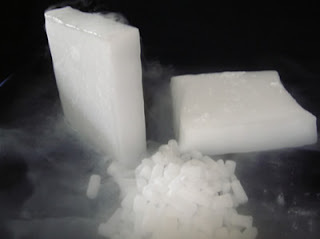 Oh the dry ice, I had to run out and buy some to try to keep things cool. What a day. I still have to bake.